Donald Trump was in Toronto for the ground breaking ceremony at the first Trump International Hotel & Tower on Monday. Construction began on the 65 storey tower in late 2007 and was completed earlier this year. 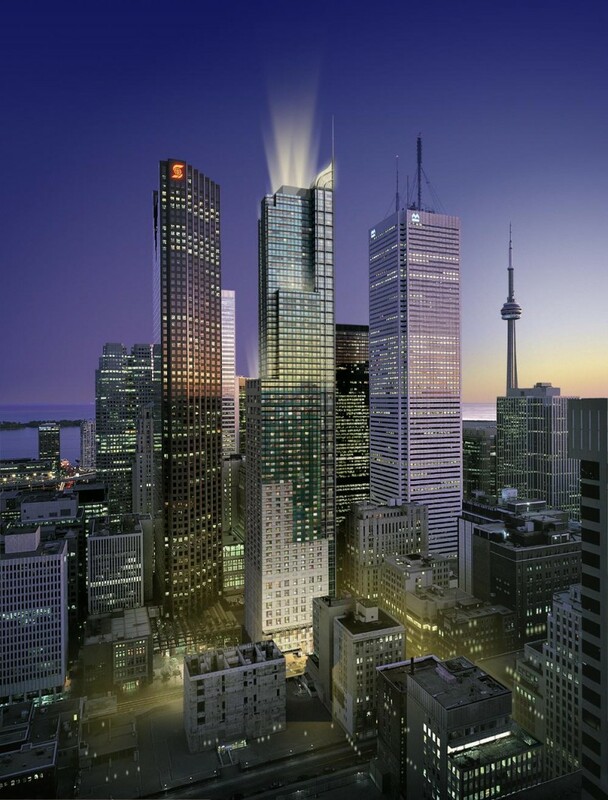 Loacted at Bay Street and Adelaide Street West (325 Bay St) in the heart of the Financial District, Trump Tower has 261 hotel/condo suites (owners can use the rooms when in Toronto, and receive revenue when guests stay in them), priced at $970,000 and up, and 118 residential condos. About 60% of the residential suites are sold, and the remaining units are priced between $2.3 million and $6.3 million. Around 80% of the total suites have been sold, of which 35% are Canadian buyers. The mix of owners include investors, full-time residents, and those using them as a pied-à-terre or corporate suite. Trump Tower was designed by Zeidler Partnership Architects, and developed by Talon International Development Inc. and Trump International Hotel and Towers. The interior was designed by II By IV Design Associates. Suites range in size from 578 sq ft to 7366 sq ft.